When the phone call came to Andrea Underwood and her brother Paul Adams, on the other end was a solicitation. Instead of a scam or the requesting of a donation to a cause or organization no one has ever heard about, Underwood and Adams knew who exactly who was calling. Because of that, the Meadowbrook Mall has a new tenant in a familiar location with a familiar product. 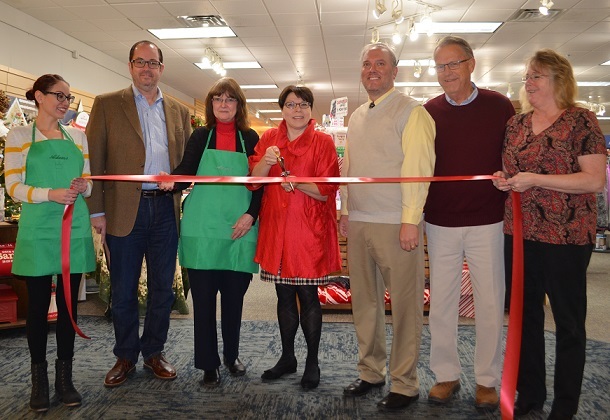 This morning, the official ribbon-cutting ceremony was held for Adams Hallmark. Adams Hallmark is located in the same spot as Lileigh’s Hallmark Shop that closed in October. Less than two months later it’s been replaced. It all happened because of that phone call. Underwood isn’t joking when she says “they ran with.” With the lease signed, the goal was to get open before the start of the holiday season. That periods wasn’t measured in months, but rather weeks. “We were able to open Nov. 17, the Saturday before Thanksgiving. We get in under the gun and it was a challenging install,” said Underwood. “It was critical to open at that time. The best part was that once the store opened it had the one thing it needed – customers. And plenty of them. The brother and sister combo are no strangers to Hallmark and the retail business. Between them, they have seven locations and they’re a ll in West Virginia. 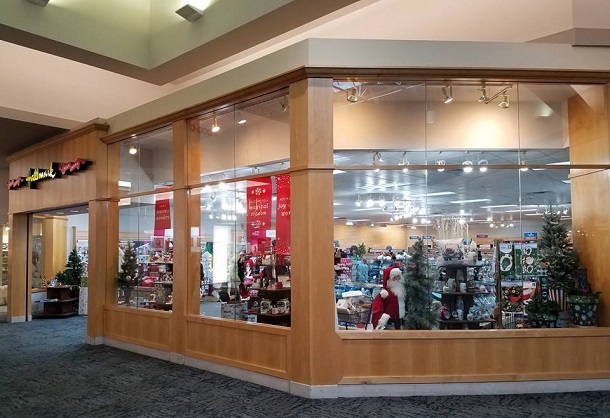 Along with the Huntington Mall in Barboursville, they have two locations in Charleston, two in Morgantown and one in the Grand Central Mall in Wood County. “This is lucky number seven,” Underwood said. Underwood said she plans on being around for five years at a minimum. There’s a reason for that. “Five years is the term of our lease,” she said. “We hope to be here far beyond that, and believe we will. The new Adams Hallmark is open during regular mall shopping hours. They will also follow the holiday hours of the mall. To learn more about their products or have questions about the hours of operation, you can contact the store at 304-848-0987. The business is located across from Ulta and beside the former Elder-Beerman location. Editor's Note: Andrea Underwood gets ready to cut the ribbon on her business as city and mall officials, along with Adams Hallmark staff, join her. 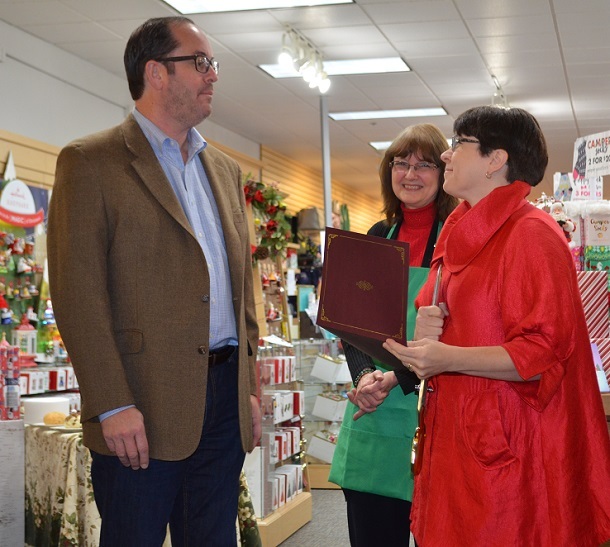 The second photo shows the store from the outside, while Mayor Andy Lang, left, presents Underwood with a certificate welcoming the new store to Bridgeport as a staff member, center, looks on.